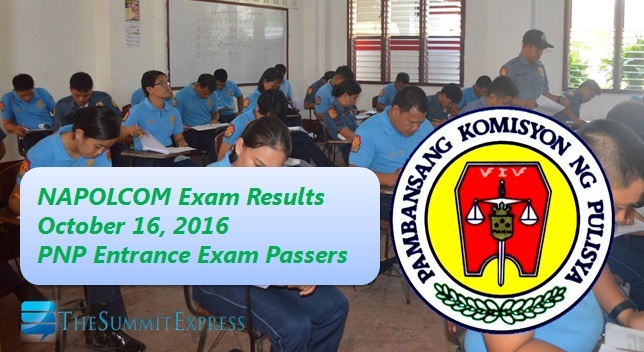 The National Police Commission (NAPOLCOM) officially released today, December 27, 2016 the results of October 16, 2016 Philippine National Police (PNP) Entrance Exam. A total of 2,946 or 11.57% out of the 25,462 examinees passed the examination conducted in designated schools in Metro Manila and other testing centers nationwide. This was announced by NAPOLCOM Vice-Chairman and Executive Officer Atty. Rogelio T. Casurao as the Commission released the partial list of successful examinees in the PNP Entrance and Promotional Examinations [Police Officer (PO) and Senior Police Officer (SPO) categories only]. 118687, CABANG, JOHN DAVID . 167996, MENPIN, FRANCIS VON ALBERT . 049466, MIÑOZA, MARY CREZ . 049346, NAVAJAS, JOHN KENNITH CHIKA . 048933, PORCA, JOHN LEMUEL . 148742, RUBILLAR, ERIC WINDER ? Vice-Chairman Casurao reiterates the Commission’s earlier warning for applicants of the PNP Entrance and Promotional Examinations not to commit any form of examination irregularity, such as cheating, impersonation, perjury or violation of examination rules, since the NAPOLCOM has a computer system that keeps track of the answer patterns of examinees. Atty. Casurao said that the list of successful examinees will be posted at the NAPOLCOM central office located at the DILG-NAPOLCOM Center, NAPOLCOM Bldg., Edsa Corner Quezon Avenue, West Triangle, Quezon City, and can be viewed at the NAPOLCOM website at www.napolcom.gov.ph. Individual reports of rating will be mailed to all examinees. Verification of test results will be entertained at the NAPOLCOM central office and its regional offices nationwide in January 2017.